Doug and Emily Coombs started Steep Skiing Camps Worldwide in 1993 to give people the best skiing days of their lives. Liz and Miles Smart continue the tradition today and gave me one such day in March—a bluebird powder day off the Aiguille du Midi in the French Alps. I was in town for a couple ski days with a patroller friend on exchange for the season in [R106R, Chamonix]. He suggested we ski with his friends Liz and Miles, two Union Internationale des Associations de Guides de Montagnes (UIAGM, also known as the International Federation of Mountain Guide Associations in English) guides who happened to be coaching a weeklong steep skiing camp. We joined three clients (a Russian, an Austrian and an American) for two perfect days in the land of steep skiing. 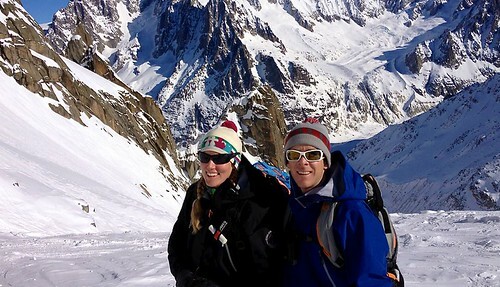 Liz and Miles Smart continue the Doug Coombs' legacy by running Steep Skiing Camps in the French Alps. Photo by Tess Weaver. Liz Smart grew up in [R25R, Aspen], interning with local guides before she could drive. She came to [R1931R, La Grave], France in 2003, training to be a guide while skiing with Doug Coombs. Miles, who in 2004 was the American Mountain Guides Association’s Guide of the Year, met Doug Coombs in 2002 as an Exum guide in [R191R, Jackson], Wyoming. Both worked and skied with Doug Coombs for years. After his passing in 2006, Emily Coombs asked the Smarts to continue the camps. The camps don’t turn a profit, but continuing the Coombs’ legacy is important to the couple. Steep Skiing Camps offer world class skiing to expert skiers looking for the ultimate challenge. Photo by Tess Weaver. Liz and Miles own and run their own guiding company, Smart Mountain Guides, which offers custom ski, ski mountaineering, mountaineering and rock climbing trips. But when it comes to the Steep Skiing Camps, they run them just as Doug would have. Liz and Miles teach technique in the field and the clients learn while doing. Following my day skiing with Steep Skiing Camps Worldwide, I had the opportunity to sit down with the Smarts and ask them a few question. The Q & A below is excerpted from that interview. How are the camps run differently than other camps in the genre? One of the big differences is terrain. We are able to get the skiers into real steep ski mountaineering terrain, which of course gives the camps a different flavor than some of the other camps. Also, there are a lot of camps out there which aren’t run by certified guides. Our camps are run exclusively by UIAGM certified guides that have extensive ski mountaineering experience. Do you bring in other guides for the camps? There are a number of other guides—mostly local French guides—that Doug used to work with and we use them if we have enough people. What is Doug’s legacy and how is it carried out through the steep camps? Doug’s legacy is steep ski mountaineering and his ability to share his passion for the sport with others. He possessed a gift for showing others how to experience this type of skiing. Doug had an ability to bring out the best in people, especially when it came to steep skiing. He showed more people the "best day of their lives" than anyone else I know. 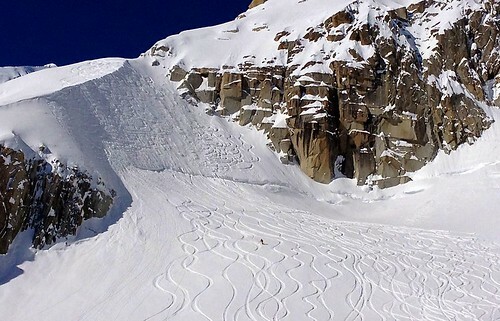 When the snow is plentiful, the Camp focusses on powder skiing. When there's less snow, technical steep skiing technique is the concentration. Photo by Tess Weaver. How have the camps evolved over the years? The big change with the steep camps was when they moved from Jackson Hole to the steeps of La Grave, [R484R, Verbier] and Chamonix. We try to maintain the same spirit of the camps that has always been there. We show skiers the descents of their dreams within a good learning environment. What are the biggest challenges of running the camps? You always have the challenge of dealing with the weather and conditions of the week. Some weeks are big powder weeks and we are not able to work as much on technical steep skiing technique, other weeks there’s no fresh snow and we spend lots of time on steep slopes and couloirs in spring conditions. We try to just ski whatever is best given the conditions. What’s on tap for next year? We will only be running one camp. 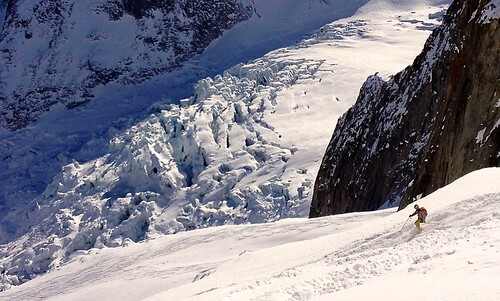 We will do the Chamonix Steep Camp February 16-23, 2013. The cost will be $3495 for the week. We are also offering private steep camps next season. More info on the private camps will be on our website soon.